London, 1937 - Intelligence had discovered that Top-Secret documents are missing. So, to, is MI6 Agent Adler, The only clue is an intercepted message 'Trafalgar at seven'. MI5 Agent Gold, Inspector Sharpe of Scotland Yard, and Constable Townsend have been thrown this task: Find and eliminate Adler. They've got seven hours. 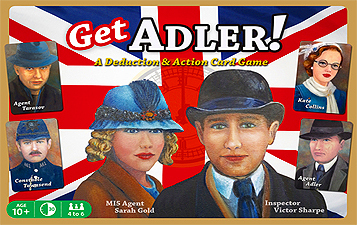 GET ADLER is a multi-player card game in which secret characters investigate each other to unmask Adler. Once the traitor is revealed, the game transforms into an action-packed race against time to eliminate Adler and to recover Top-Secret documents.